Backstory: I've been a Barista in high end coffee for about 4 years now. One of the things you learn early on is that it is distasteful to ever ice espresso. Many go forward never questioning why this is such a bad idea, but I have an inquisitive mind and looked into it further. It turns out that coffee is high in chlorogenic acid, which, as the coffee cools, forms quinic acid, which has a noteable and overwhelming astringent flavor. So the task is to brew coffee in a way that does not involve heat, and also reduces the apparent acidity. In the 60's the Toddy method became popular and it produces a finished product that is notably less bitter and actually puts forward a deep caramel and chocolaty flavor. It is perfect for a warm day. 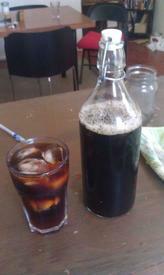 I decided to make my own cold brew coffee brewer.